What better job to be doing than this – a blog post about a gloriously sunny Chaucer Barn wedding when it’s freezing cold and miserable outside right now! Dan & Naomi chose to celebrate their wedding on a wonderful May Saturday at the amazing Chaucer Barn, fast becoming one of my favourite venues. The day started with me grabbing a few photos of Naomi getting ready inside the main house, whilst my lovely second photographer (Liz Bishop Photography) arrived to photograph the boys. 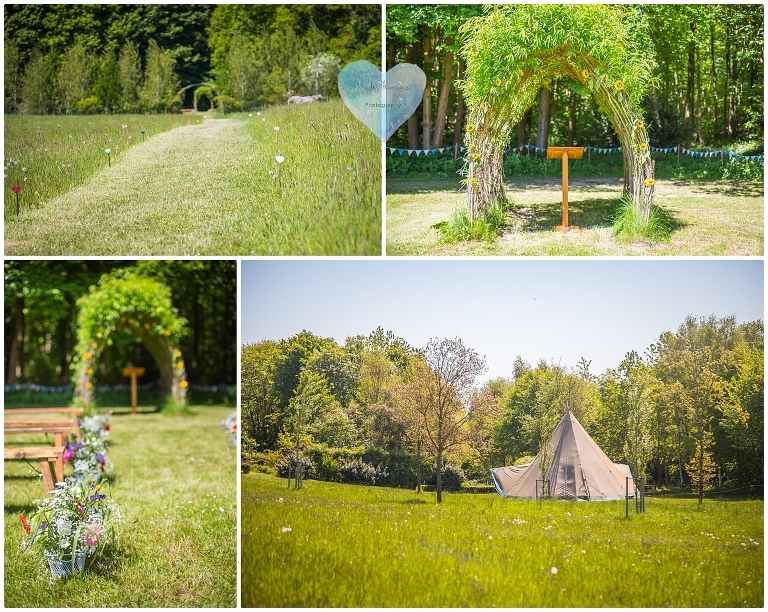 The actual ceremony took place in a beautiful woodland glade at Chaucer, whilst the wedding breakfast was held in a Tipi tent (Magical Events Ltd) nestled in amongst woodland and flower gardens – such a stunning setting. 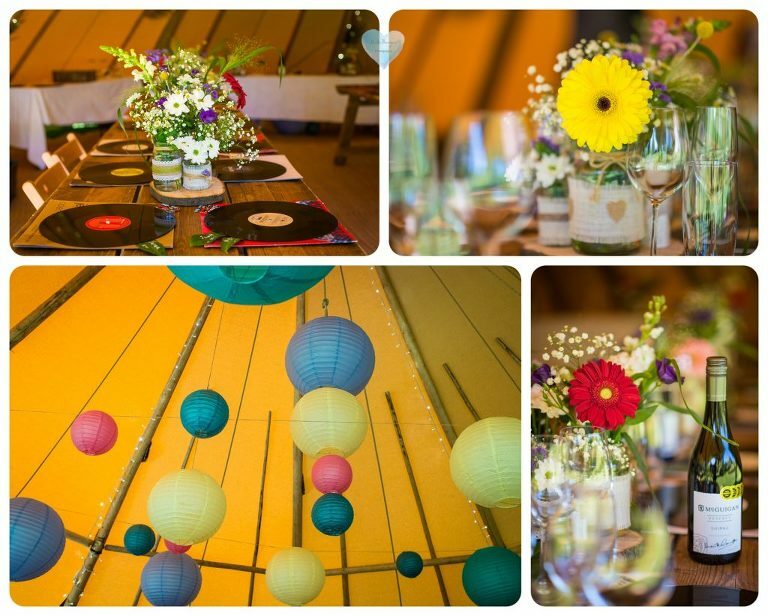 The place settings for the wedding breakfast were LP records – such an original idea! Naomi, her dad & bridesmaids walked down the mown grass path, lined with tiny hearts on sticks, from the house to the woodland ceremony area, where the guests were seated in a woodland clearing. 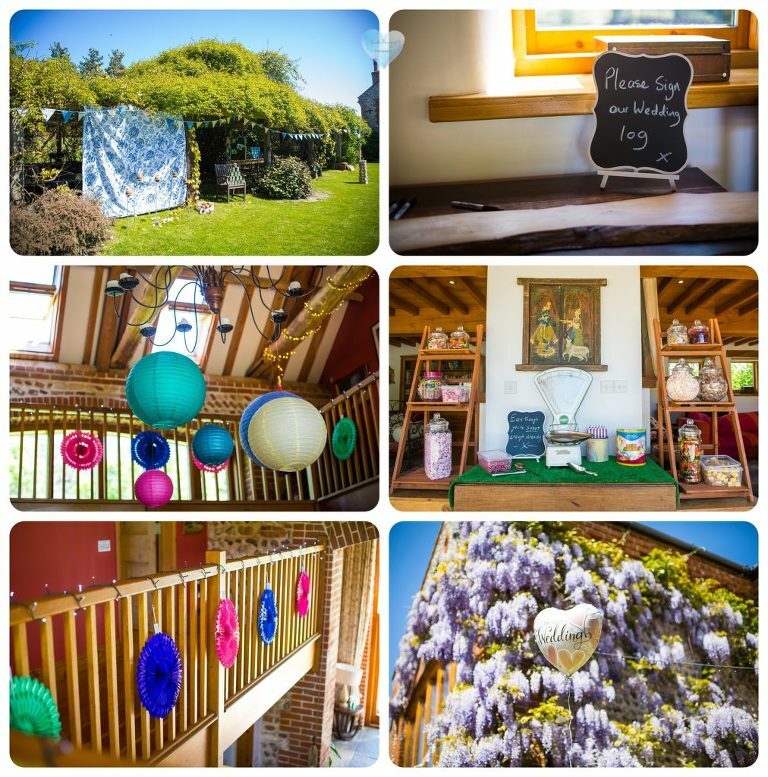 Once the ceremony had taken place, the guests strolled back in the sunshine to the garden outside the main house and enjoyed drinks, canapes and games (the coconut stall proved very popular as did the giant Jenga!). The whole day was superbly organised and managed by Dan and his ushers, who all had walkie talkies to keep on top of events – and they were hilariously using such codenames as “twinkle, rainbow” and “Nemo”!. A short stroll over to the Tipi tent for the speeches (absolutely everyone was in tears of laughter at Naomi’s dad’s speech, which involved a giant gnome), followed by the wedding breakfast of delicious pie & mash, provided by Pie Central. We then spent a short time photographing some really fun family group photos – at one point with Dan & the ushers being hijacked by Naomi & bridesmaids shooting Nerf guns at them – before I grabbed the couple to get some sunset photos. Chaucer Barn really does have the BEST setting for these with it’s beautiful meadow and shaped hedges! Onto the first dance where Hello Hurricane provided music that literally had everyone up on the dance floor and staying there! I snuck Naomi & Dan away quickly to toast a few marshmallows, before reluctantly leaving the party to head home. What an incredible day it was – spent with such lovely, lovely people – an absolute joy to be involved – I’m very privileged with the work I do and I hope the photos reflect my love of that work!